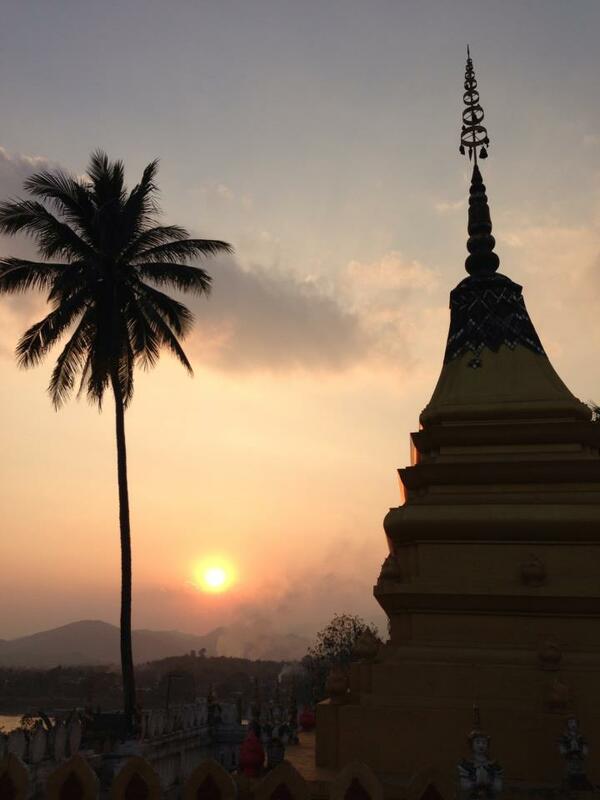 Finding Peace, Relaxing in Laos – Traveling Epic! Michael wanted to go to Myanmar, and I wanted to go to Laos. So we compromised and flew to Thailand. The wonderful thing about Thailand is it is a great hub. The people are amazing, the food is amazing, the culture is very rich, and it’s very cheap to get around. Can you believe it’s 30 Baht to the $1? It’s a good time to visit Thailand for sure. Day tripping from Chiang Rai to Myanmar or Laos is very easy. We ended up spending a couple of days in Laos, but in hindsight it was really really peaceful and relaxing. After getting a couple of photos for a couple of dollars on the Thailand side, we cross the river in Chiang Kong. I think we paid less than the equivalent of a dollar to cross the river into Laos. The first place we visited was this temple pictured above. The oldest monk we ran into was the one next to me. A very young contingent of monks and what was different about these guys was their interest in us. 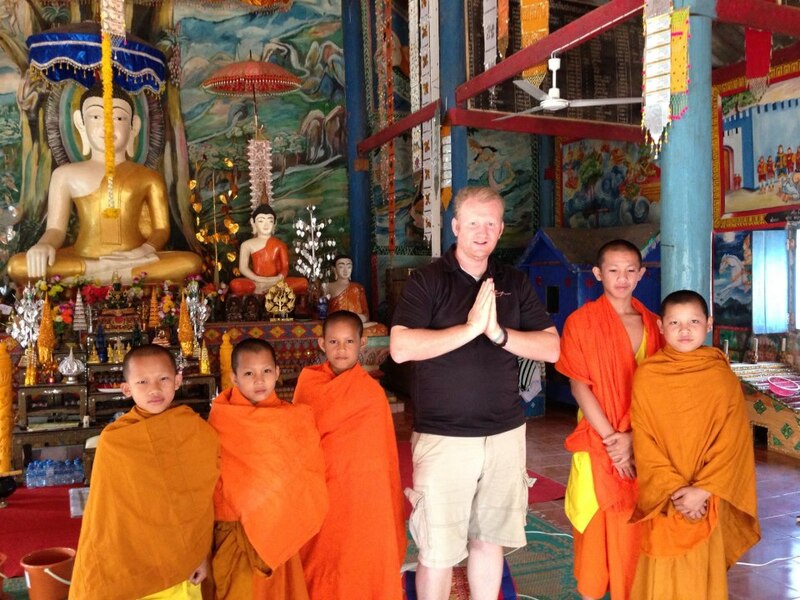 For the most part when I’ve visited buddhist temples the monks usually avoid the camera and stay in the background. In contrast these very friendly monks were very interested to get to know us and understand why we were visiting. It also explained why there was a guy on a guitar playing to a group of monks as we ascended the hill up many stairs to visit this temple on top of the hill. 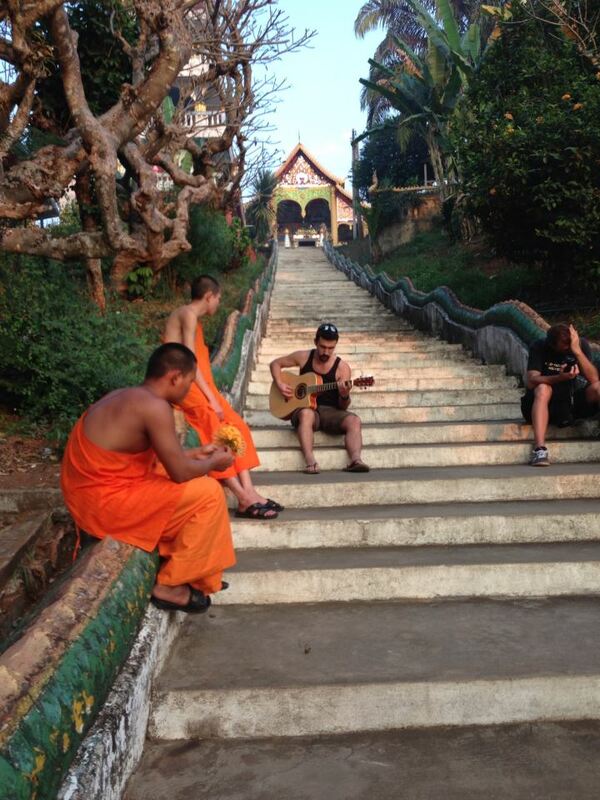 What’s more relaxing than listening to some acoustic guitar with monks as the sun goes down? These brazilian guys were really relaxed as well… no hurry at all. When I say this is a great place to relax, I’m obviously not talking about getting away from it all, and taking life at a different pace. Very easy to leave your worries behind and take a breather. I was amazed how immediately it seemed to happen, almost within seconds. The river really takes a hold of you. From where we were, you could go upstream to China, or downstream to LPQ. One thing that really surprised me was the integration of army surplus. This hut is literally built on B52 bombs. These were either unused or duds. Most of the explosive material has been taken out, but I’m not sure they still wouldn’t have enough to cause problems if the kids started hitting these with a hammer. 1. The people aren’t keeping up with the joneses. In fact they are just surviving and thinking about their families. 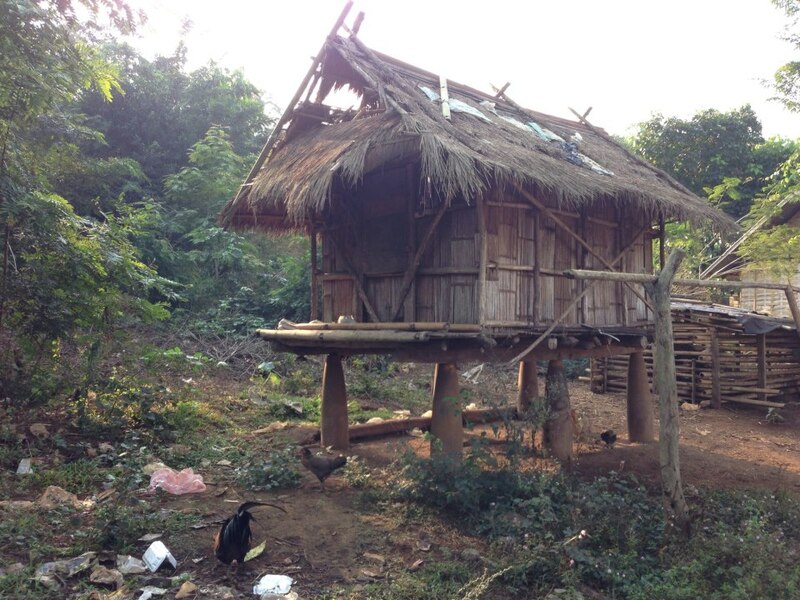 They could be working on bamboo for the roof, or working on making whiskey a long and drawn out process. 2. The numerous number of temples and monks who seem so peaceful and make me want to sit on a pillow and meditate. I took that opportunity a couple of times. Very peaceful. 3. Industry – What do the locals do? They aren’t doing major commutes, they simply walk or ride their scooters everything is very local. Our guide owned duck farm, fish farm, and he was a guide on the side. 4. The River – those who have studied Siddhartha know it was the river that helped him find peace. Right outside our $20 hotel was the river. The Mekong gives life. Life revolves around the river. 5. Massage – A good massage is so valuable. I can’t resist a good massage. Especially when it’s very accessible and cheap. It’s the right price and the right time. I don’t want to tell the MAN, but I know Laos is one place that’s a great place to escape the pace of life and focus on peace if I ever need to. The Patron Saints of Travel – Who were these Wise men or Magi?